Sarah’s Tent Gallery is located in the heart of Jerusalem and more specifically on 18 Shlomzion Hamalka st. Its main objective is to promote, publicize and support the emerging national artist whose originality and work transcend the diversity which underpins today’s dynamic art scene in Israel. 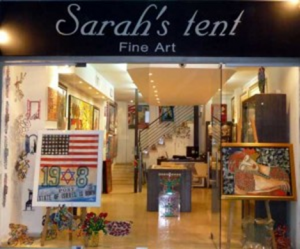 Sarah’s tent gallery is dedicated to bring to you the newest and most prominent Israeli artist to the market. The Focus of the gallery today is on extensive collection of paintings and vibrant colors sculptures. The gallery is always evolving with the new materials and imaginative creations of Israeli artists.We are constantly bringing new art and established new artists to offer to our customers the widest selection of original art. The gallery has acquired recognition as being among the finest source for contemporary art and Israeli Fine Art. We welcome you to visit our Gallery. Please contact us for more information about our artists and latest works posted on the website. We will gladly respond to all requests.